An estimated 36.5 million Americans suffers from eye-related diseases, including age-related macular degeneration, glaucoma, and cataracts. Thankfully, new research demonstrates that certain diet choices can help to support optimal eye health. 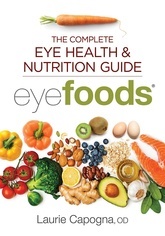 In Eyefoods®: The Complete Eye Health and Nutrition Guide, optometrist Dr. Laurie Capogna offers a groundbreaking plan for improving eye health and slowing or preventing common eye disorders. This easy-to-understand guide includes in-depth research based on 20+ years of clinical experience from a pioneer in the field, supported by recent scientific findings.